The following is a chronology of VPB-118 based mainly on the book with with additional information from crew members and what other pertinent sources are available. The US Navy utilized squadrons of PBY-5 and PBY-5A's, smaller, slow-flying boats/amphibious planes with light weaponry and light payload capacity. Most of these planes were used for reconnaissance but a few were used for combat. One of these squadrons was VP-71, commanded by Cmdr. Harry Sears. The navy started using B-24 Liberators, known as PB4Y-1's. These planes could stay airborne up to 12 hours and had guns in the nose, tail, side bays, top, and underneath. Also, they had two bomb bays, one of which could hold auxiliary fuel tanks. VB-104 was created as the third Pacific PB4Y-1 squadron, with Cmdr. Sears as CO. Cmdr. Kelly Harper, the future CO of VPB-118 took over as CO of VP-71. VP-71 left Hawaii in July 1943, going to Espiritu Santo and then the Solomon Islands. By then VB-104 was also stationed in the Solomons, close by. VP-71 relieved VP-24, which included two future crew of VPB-118: A.J. Hopkins and Vincent Abate, who was in VP-24 during the Battle of Midway. On July 16 VP-71 flew a bombing mission on Nauru with a force of six planes. No planes were lost but there was lots of shooting and the Japanese counter-attacked their seaplane tender. Another future member of VPB-118, Tom Kelecy, was Cmdr. Harper's radioman on that mission. Cmdr. Sears' PB4Y-1 unit, VB-104, received the Presidential Unit Citation for its aggressive tactics which helped transform the image of the naval patrol plane from that of a mostly passive reconnaissance plane to that of a serious threat that could search out and attack targets of opportunity at sea. After its first tour of duty, ten of its pilots became PPC's in VPB-118 when it was formed. From VP-71, five pilots became PPC's in VPB-118. VPB-118 also gained eight skilled aircrewmen from VP-104 and two from VP-71. As they stated it, "VPB-118 was an extension of VP-71 and VB-104." VPB-118 was commissioned at Camp Kearney, near San Diego, on 7/1/1944source, with Lt. Martin Gentry as Acting CO. On the fourteenth Lt. Harper, former CO of VP-71, arrived and assumed command. Gentry became Air Combat Intelligence Officer, Lt. Cmdr. Art Farwell became Executive Officer, Lt. Edward Binning became Operations Officer, and Lt. Mark Montgomery III became Engineering Officer. The new squadron was transferred to Naval Auxiliary Naval Air Station, Crow's Landing, which was then a quiet crossroads in San Joaquin Valley. 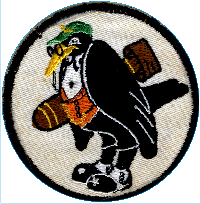 At this time the squadron adopted the Old Crow Whiskey crow as their symbol, with a bomb under its wing, and started calling themselves "Old Crows." The station had two 7,000 foot concrete runways but could only accomodate one squadron at a time. Flight crews also spent a week at NAS Almeda and trained on what was then advanced gunnery simulators that trained them in aircraft recognition using an early form of electronic scoring. The Air Combat Intelligence Officer, Lt. Martin Gentry, transferred out owing to persistent malaria symptoms, and was replaced by Lt. Wright James. Leading Chief Woodward also transferred out and was replaced by squadron member A.J. Hopkins, who was at Pearl Harbor on 12/7/1941 while in VP-24. PPC's Dodson and Finley picked up the first two PB4Y-2's to be flown by an operating squadron. In Dodson's crew that day were co-pilot Ens. Richard Carmelich, AMM1c Tom Bay, ARM1c Harold Peterson, and AMM2c Paul Crowley. The operating manuals were in a large box and after scanning them the crew took off and flew the plane to Crow's Landing. On the next two days four more planes arrived and the squadron started training with them. The squadron flew practice flights over San Francisco Bay, bombing a grounded DD with water bombs. They also had flights over Monterey Bay, the Channel Islands, Yosemite Valley, Los Baños, and other points around California. They dropped hundreds of practice bombs, over 100 TNT depth charges, and over 800 miniature bombs on a target marked on the ground in the shape of a ship. They also fired almost 18,000 rounds of .50 caliber ammunition.